Please make a donation towards the costs of developing the Phase 2 program in Uganda: sponsoring farmers and evaluating the impact of the service. Broadfield Enterprises Uganda (BEU) is implementing the 2nd Phase of the permEzone program, working with farmers in Sanje Village, in the Central Region of Uganda. BEU was founded in 2012, and incorporated as a Social Enterprise in 2016. It is focused on the creation, implementation, and use of innovative climate change adaptation strategies using the permaculture ethics and principles, especially with the most vulnerable populations of rural farming communities. In 2018 BEU participated in COY14 (Conference of Youth) and COP24 (Conference of Parties) in Poland and offered sessions on Permaculture introduction and Design in the context of the UN's Sustainable Development Goals, and Permaculture Policy inclusion for effective response to climate change challenges and the Paris Agreement. 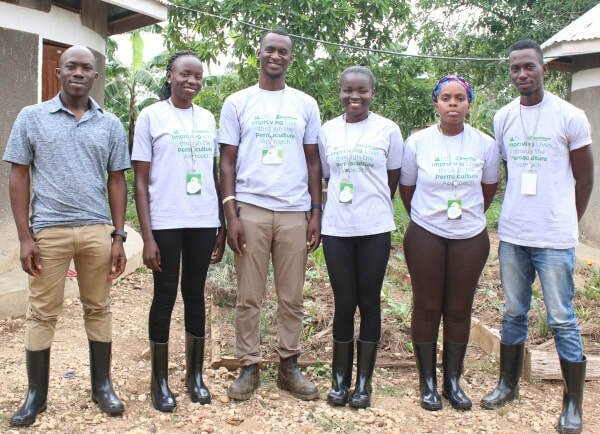 The BEU Team - from left to right: Peter Bukenya- BioGas Designer and Trainer, Juliana Lanyero - Finance and Trainer, Charles Mugarura- Team Leader, Mercy Kayoddi- Trainer, Victoria Abigaba - Field Trainer, Emmanuel Walusimbi- Visual Data Developer. Charles Mugarura is BEU’s representative for Phase 2 of the permEzone pilot program. He is a qualified permaculture designer and teacher whose permaculture journey began in 2008 at Blue Mountains Permaculture Institute of Australia, under Rosemary Morrow. He has subsequently taught 5 PDCs and 30 short trainings including a PDC in May 2018 graduating 42 students. Charles hosted and organized the first East African Convergence in May 2018, with 70 participants at BEU's field site. He is continually involved in efforts to integrate permaculture into the national education curriculum in Uganda. Charles facilitated two permaculture workshops in Germany at the Conference of Youth (COY13), the annual youth climate summit, and delivered the official position paper on climate change at the Conference of the Parties (COP23) at the United Nations. He has received a number of awards, including the Youth Climate Change Activist from Global Citizen, NYC in 2016. He has previously coordinated projects in Rwanda and Kenya and worked on business behavior and sustainability in Germany. 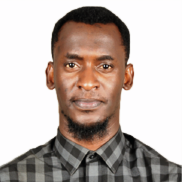 Charles will be a key member of the permEzone Mobile Team - he holds a diploma in Computer Science in Business from Makerere University Business School, developed a PermApp, and worked with WeFarm Uganda analyzing data on farmer’s challenges and solutions.